I recommend printing out these directions or putting the address into your SatNav device. We are located just north of Brossac on the D7. 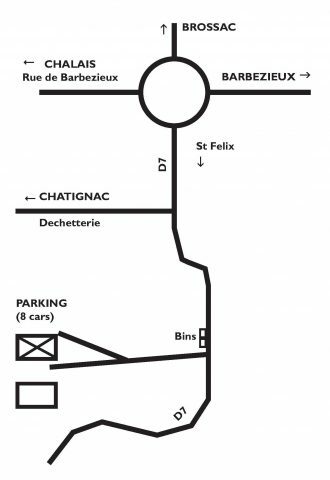 If you are on the Rue de Barbezieux at the roundabout just outside of Brossac, head toward St. Felix , past the right turn for Chatignac, down the hill and before a sharp “s” curve on the D7. If approaching from St. Felix, we are under the new TGV bridge on the D7 towards Brossac, just after the dramatic “s” curve before the turn left for Chatignac. There are two bins at the end of the drive, the only ones, on the east side of the road. It is easy to miss but there are small signs at the end of the drive that say Le Bourgoin in both directions. There are two houses. Ours is on the right-hand side…the smaller one. It’s all white.